Vladimir Nabokov's "Ada, or Ardor"
Philip Roth said in an interview that a novel must be read within a fortnight or else the experience would be much dissipated. I think Nabokov's Ada cannot be read so quickly. Each chapter, quite short but so dense with imagery, wordplay, and recondite allusions, must be read slowly, and then savored in the mind's mouth by turning off the spigot of liquid riches, by closing this most unusual family chronicle of incestuous love. I came out as a gay man 13 years ago. I trace the moment back to my first attending a meeting of GAPIMNY, the Gay Asian Pacific-Islander Men of New York. Since then I've been coming out, again and again, to family, friends, and strangers. Yes, there is such a thing as coming out to oneself, an internal understanding and acceptance of one's own sexual identity, but coming out of the closet is essentially a public act, of saying to others "Hi, I'm here and I'm queer." Some in the LGBT community have argued that talk of coming-out reinforces the heterosexual norm and marginalizes ourselves. Straight people do not have to come out as straight. 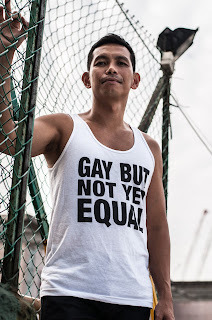 This argument has no force in Singapore, where heterosexuality is overpoweringly taken for grant, and so the act of coming out constitutes a challenge to that norm. Our bodies must be seen. Our demands must be heard. Our persons must be respected and treated equally as those of straight people. Kei Miller's "The Cartographer Tries to Map a Way to Zion"
Had a really special afternoon with the daughters of my late junior-college English teacher Keith Wiltshire. 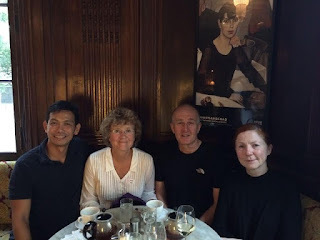 It was lovely to meet Grace and Christine finally, and Grace's husband Pete. After torte, tea, and wine at Cafe Sabarsky, we walked over to Shepherd Gallery, where Christine's husband, Lin, an artist, works. We were given a little tour of the current show by the owners. Then more drinks--gin and tonic--and conversation. We miss you, Keith.